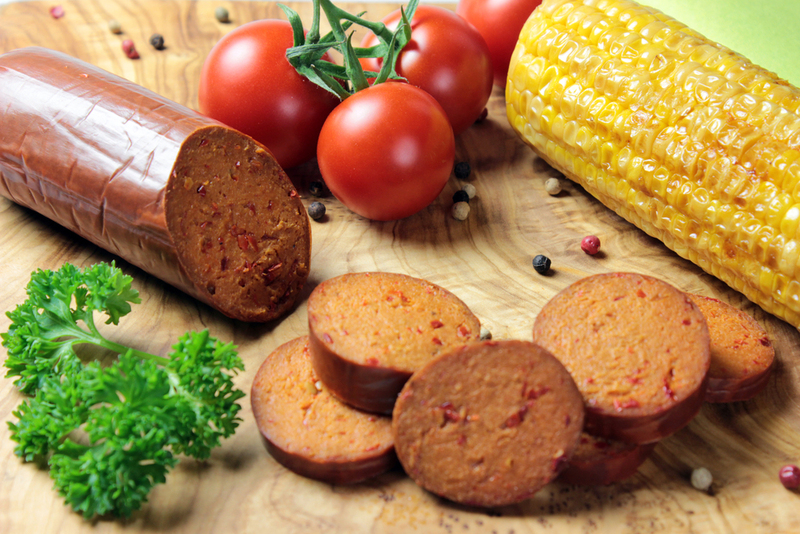 Our delicacy "Chorizo" brings Spanish flair in the vegetarian natural food world: solid, savoury, full-bodied, air-dried! This means that with this delicacy there is for the first time a vegetarian product that has been given salami-starter culture and is air-dried. Lactose-free, without eggs and super-tasty! This product gives whole new dimensions to the vegetarian field. seitan* (water, WHEAT protein*) 67%, red bell pepper*, coconut fat*, onion*, yeast extract*, rock salt, spices* (contains CELERY* and MUSTARD*), thickening agent locust bean gum*, smoke**. * = certified organic. **= natural beech wood smoke.